USB 2.0 repeater cable is an active device. The USB signals going in and out of the extension cable is buffered to assure signal quality and meeting of the USB electrical and timing specification. The usb 2.0 Active Repeater Cable acts as a single port hub, which means that multiple cables can be cascaded (up to 5 to increase the distance between your computer and USB devices. It can extend the distance of a USB Device up to 75 feet. Extend USB2.0 up to 30Ft (10m). Connector: A male to B male. Data transfer up to 480Mbps Plug and play. No external power required. Data transfer up to 480Mbps. Plug and play. No external power required. This USB extender allows you to conquer the 5 Meter USB length limitation, Connect your USB peripherals and important equipments without regard for proximity. The USB Extender uses Cat5, Cat5e, or Cat6 RJ/45 cable to extend the range of your USB devices by up to 200 feet. This is an USB active extension cable that can be used to increase the length up to 5m. With this cable; you could extend two devices; like keyboard & mouse over one USB cable at the same time. QVS 3ft USB to Audio & Video Capture Adaptor Cable. Digitize analog video for input into any computer with USB port. This adaptor allows you to capture & edit analog video from video camcorder or VCR and provides two RCA stereo connectors to capture audio simultaneously and directly from USB port. It supports up to 30 frames per second at 352x288pixel resolution and RCA & S-Video connections. Includes software plus a snapshot button to capture still photos at 640x480pixels. Works with Windows 98SE. ME. 2000 and XP systems and compatible with NTSC. PAL & SECAM formats. USB Extension thru CAT5e Cable. This unique USB Extender lets you locate your USB device or hub up to 150 feet from your computer; overcoming the typical 15-foot USB cable limitation. Patented ASIC technology conditions the USB signals to communicate up to 150 feet using low-cost CAT 5/5E/6 cable. Now you can enhance the capability and usefulness of your USB devices. USB 3.0 Active Repeater Extension Cable enables you to connect a computer USB port to a USB device 5 meters away without signal loss. This USB 3.0 repeater cable support data transfer rates up to 5 Gbps and is fully backward compatible with USB 2.0/1.1 devices. 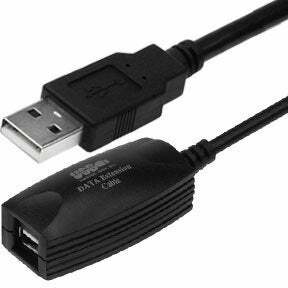 USB extension cables are used to extend existing USB cables or to use as an extended length USB cable. Active repeaters electronically resend the signal to ensure that the signal does not degrade. USB extenders are available with Ethernet connection to use existing Ethernet cables for a maximum length of up to 150 feet. We have high speed active extension cables, active repeater cables in various combinations, USB 2.0 extenders, USB extender via Ethernet, USB extension through thru Cat 5E cable, many more products to choose from.